I am extremely excited to be exclusively showing the official book trailer for Heart-Shaped Bruise by the fabulous Tanya Byrne. Isn't it fabulous! I can't even put into words just how excited I am by this book! The lovely marketing team at Headline have also written a post discussing how the trailer came about. So here they are telling us all about it in my new author feature. In our initial discussions about the trailer, we were clear from the start that we wanted to focus on Emily and also showcase the dark and striking look of the book jacket. We decided to create a trailer that mixed frames of Emily’s own words, designed in the style of the book cover, with some more unsettling, fleeting video snap-shots of her in the psychiatric ward; staring out of the window, playing with her hands, scribbling in her notebook, as she does during her sessions with Dr. Gilyard in the book. For the words, we chose a section from Emily’s opening letter to Juliet, as nothing portrays her character, motives and obsessive need for revenge more honestly and powerfully. We wanted to add tension by drip-feeding the words onto the screen frame by frame, with the animated rose petals from the book jacket slowly cascading down the side. To film the ward shots of Emily we went in search of a small, blonde (and willing) volunteer, who we found in one of our lovely editorial assistant’s, Lucy – another huge fan of the book who took to the troubled character of Emily worryingly well… The shots were filmed in our Euston Road offices, which provided the perfect backdrop for the North London setting of the book. Once the trailer was edited, we decided on the music for the background and we went for something that would subtly put the audience on edge as well as mirror the sinister words and images on screen. You can’t ask for a better reaction than that! 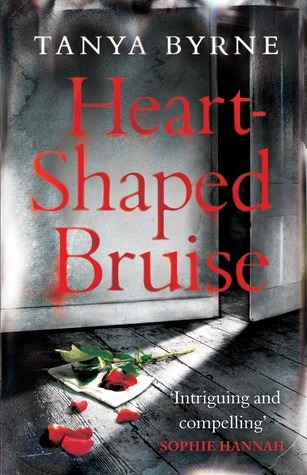 Heart Shaped Bruise goes on sale on the 10th May! Make sure you buy it!!! Bloggers, go forth and spread the trailer! Really? I am obviously not shouting loud enough. I will have to rectify this! LOL, where have you people been??? I must shout louder. Ooh - great trailer. Very atmospheric! Sadly I wasn't able to load the video but this does sound good and I love the cover. its an amazing trailer and I cannot wait to read the book! I need to get my hands on it, I might even pre-order it!